Oh hey, Fox lady has a face. Nice. Wait, is she the one that's allowed to kill? That's defiantly an unsavory euphemism at the very least. There are FOUR cleaners, so likely not. Cleaner means combat/dungeoneering competent as far as I can tell; which you wouldn't expect if you just thought Tobi was a kid. Thanks for correcting me, it's been a while so I kind of forgot that bit. Wait, what is going on with with guy/girls eyes. They are just dungeon cleaners. Though to me every player in a roguelike is a dungeon cleaner by definition, so I'm curious about other "roles". Maybe they are NPCs? Well.. i honestly think their reaction is kinda fair. From their point of view its kinda like discovering a kid being part of the jungle expedition you were hired to take part in. It is hardly their fault that Tobi is a lot more than what meets the eye. This is starting to look like a bizarre combo of battle royale + Saw + I don't even know. I KINDA LIKE IT. @Z2 where did it mention this? Yep there are DEFINITELY 4 cleaners and he DEFINITELY corrected you, @Jack. I also would like to express my love for this comic. One of the best I'm reading. One ear beastman just look wrong. just saying. Dang is that another ear on foxladys face or is it just me (Bad Dum chss). Page 1013 ("Trust game") is where the lady (improbably named "Doctor Lemonade") told her that she and Three were cleaners, as well as two other people, and that cleaners are there to clear obstacles, puzzles, and other challenges. So she does. 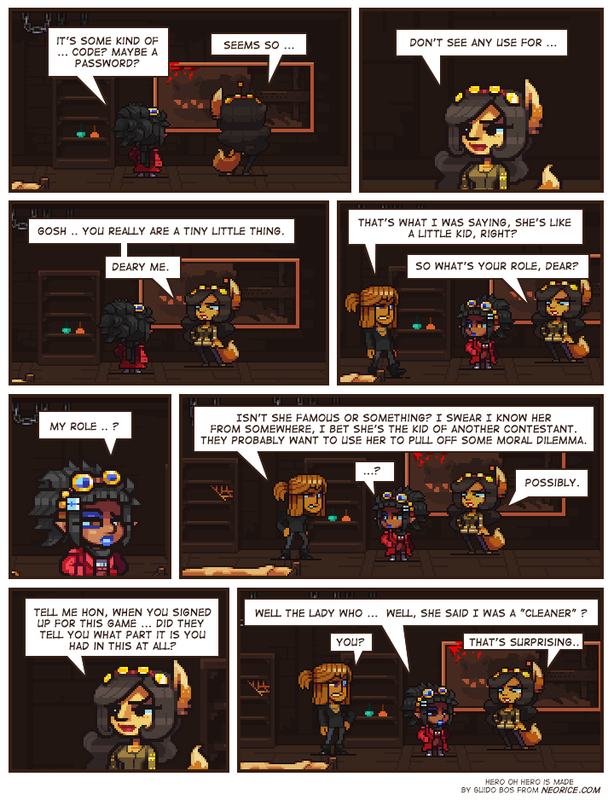 I considered putting a link to Jimi Hendrix' "Foxy Lady" here as a response, but that doesn't match the tone of the scene or this conversation at all. Somehow I don't imagine it will be an appropriate reaction in the future either, which is a shame because it's classic music.